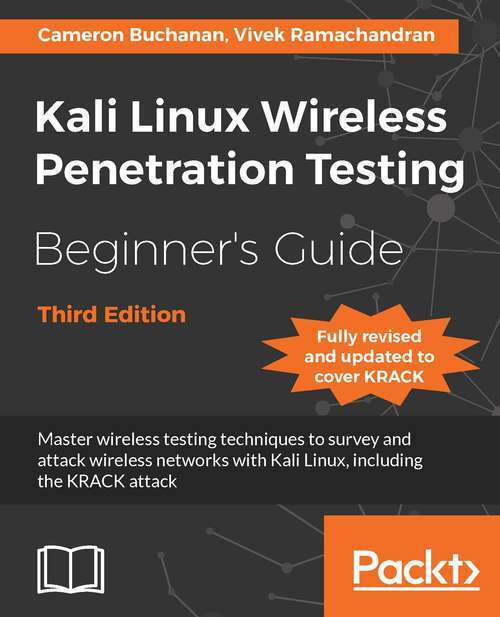 Kali Linux Wireless Penetration Testing Beginner's Guide, Third Edition presents wireless pentesting from the ground up, and has been updated with the latest methodologies, including full coverage of the KRACK attack. About This Book • Learn wireless penetration testing with Kali Linux • Detect hidden wireless networks and discover their names • Explore advanced Wi-Fi hacking techniques including rogue access point hosting and probe sniffing • Develop your encryption cracking skills and gain an insight into the methods used by attackers and the underlying technologies that facilitate these attacks Who This Book Is For Kali Linux Wireless Penetration Testing Beginner's Guide, Third Edition is suitable for anyone who wants to learn more about pentesting and how to understand and defend against the latest wireless network attacks. What You Will Learn • Understand the KRACK attack in full detail • Create a wireless lab for your experiments • Sniff out wireless packets, hidden networks, and SSIDs • Capture and crack WPA-2 keys • Sniff probe requests and track users through their SSID history • Attack radius authentication systems • Sniff wireless traffic and collect interesting data • Decrypt encrypted traffic with stolen keys In Detail As wireless networks become ubiquitous in our lives, wireless penetration testing has become a key skill in the repertoire of the professional penetration tester. This has been highlighted again recently with the discovery of the KRACK attack which enables attackers to potentially break into Wi-Fi networks encrypted with WPA2. The Kali Linux security distribution comes with a myriad of tools used for networking attacks and detecting security loopholes. Kali Linux Wireless Penetration Testing Beginner's Guide, Third Edition has been updated to Kali Linux 2017.3 with the latest methodologies, including full coverage of the KRACK attack and how to defend against it. The book presents wireless pentesting from the ground up, introducing all elements of penetration testing with each new technology. You'll learn various wireless testing methodologies by example, from the basics of wireless routing and encryption through to detailed coverage of hacking methods and attacks such as the Hirte and Caffe Latte. Style and approach Kali Linux Wireless Penetration Testing Beginner's Guide, Third Edition is a practical, hands-on guide to modern wi-fi network hacking. It covers both the theory and practice of wireless pentesting, offering detailed, real-world coverage of the latest vulnerabilities and attacks.